Tsujigahana exhibit in Canton, OH, 2009. Erica lived in northern Japan, in Aomori Prefecture, from 2003-2006, as a participant on the Japan Exchange and Teaching (JET) Programme, where she studied kitsuke as one of her hobbies (she also briefly studyed ikebana [flower arrangement] and nihonbuyou [Japanese traditional dance]). She received over 1000 hours of instruction from Nakaguki-sensei, a certified instructor of the Sodo Kimono Gakuin, the school founded by The Book of Kimono author, Yamanaka Norio. While under Nakaguki-sensei's tutelage, in addition to being asked to dress others, she participated in regional and national kitsuke competitions (the All-Japan Kitsuke Taikai), which is held annually in Tokyo at NHK Hall. She's well versed in the use of the "magic obi aid" mentioned in The Book of Kimono, and for the kitsuke competitions, utilized this obi aid (biyosugata) to tie the obi bow and wear a furisode in under 7 minutes. During her stay in Japan, she routinely shared her knowledge online, being an active member of the ImmortalGeisha (IG) Forums, and several livejournal communities. She was asked to become a moderator on IG in 2006, and continues to maintain active moderator status. Since returning to Canada, Erica has hosted workshops and has been a panelist at local conventions including Anime North, Polaris, and Ad Astra, as well as providing adjunct lectures at the Japan Foundation. 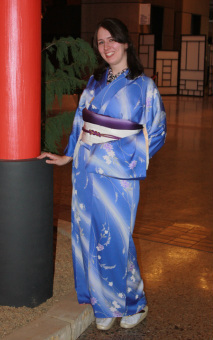 During graduate school in Chicago (2008-2010), after befriending members of the Japanese community, she encouraged them to form the Chicago Kimono Club (c.2009), and upon her return to Toronto, formed the current Toronto Kimono Club in 2010 with a friend of hers who had a similar experience regarding kimono and Japan. Erica is also experienced at dressing others, having routinely done so in Japan at events with her kitsuke sensei and classmates, but also after returning to Canada. She's run several 'yukata experience' sessions on behalf of the Toronto Kimono Club at festivals in the Toronto area, and has also been asked by local cultural organizations to do so at their events. She has also dressed people for weddings and other special events, including being a dresser for photo shoots. And several private individuals to help make their events such as weddings and birthdays a more memorable experience.